My Rachel shows a great inclination toward creative homemaking, and she has been begging to sew for a while now. I put it off because I remembered how difficult it was for the boys to sew the little bird ornaments 1 year ago and the boys were considerably older than Rachel’s 5 years. However, my little redhead is sweetly charming in her requests, and I knew I had to find a way to make this work. Apparently, the right materials make all the difference. – Oversized needles – These were called soft sculpture doll needles, much easier for little hands to grasp. – Felt – stiffer than regular cloth and easier for little hands to hold. – Embroidery Floss – We used 2 strands. It seemed to tangle less and be easier to deal with than regular sewing thread. 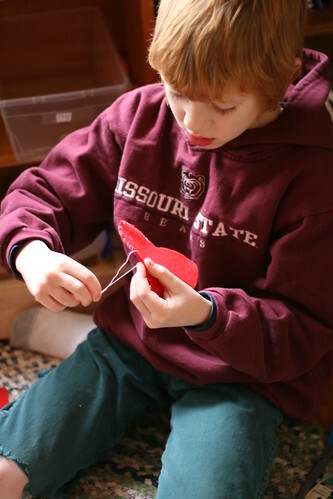 We cut out simple heart shapes. I had learned from the previous year how difficult it was for the boys to stitch an even seam allowance, so I made dots on the felt with pen, marking where the needle should go. After tying the knot and demonstrating a simple whipstitch, Rachel was able to do most of it on her own. I was careful to show her how to pull the needle through, grasping the end with the thread in it, to keep from pulling too far and separating needle from thread. 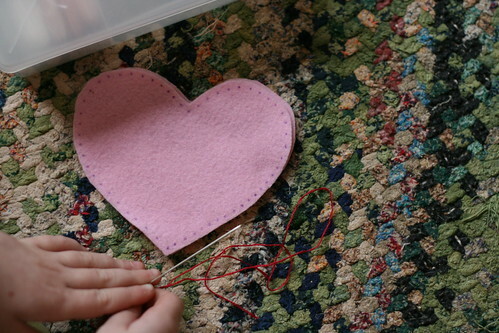 We left a gap at the top of the hearts, stuffed them and stuck in fabric scraps for a hanger. Sidney was working with Sid last Friday, but Lincoln was here. He seemed to enjoy our sewing project as well. This was a great, cheap art project that teaches the kids real skills. I think we will be doing a lot more sewing with felt, refining their stitches and teaching them new stitches and progressing to more complicated designs. 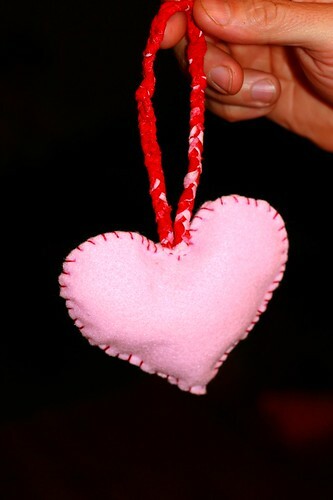 I love the idea that they can produce useful gifts, tree ornaments or even little brooches. ***I figured out later that I had forced my poor left-handed Prairie to sew right-handed. Bad mother that I am, I am constantly forgetting about the left-handedness of my fourth child. I kind of felt bad about it for 2 seconds, but then felt sure that there was research somewhere showing the brilliance of people learning to do things with their non-dominant hand. I feel so sure of this that I didn’t even bother to google this information. It is enough that I “think” it, and therefore alleviated my guilt. This child will be brilliant. Felt is great stuff. At the Dollar Tree here, you can get a pack of index card sized sheets in a bunch of different colors for a buck. I know a regular sized piece of felt isn’t exactly a budget-breaker, but you get a bunch of colors. When I was little I did a lot of stuff with plastic canvas. That’s the plastic sheets that you can do giant cross stitch on. They might be fun for the kids, because it uses yarn and also requires bigger needles. I used to make picture frames and little boxes and even some sort of container for a remote control. There are some free patterns on the web, though it’s fun to just do abstract stuff, too. Sandra, I thought I had made the remote control holder. It had a part where I could hang it on one of the posts of my bed and I kept my stereo remote in there. Did you make that for me? That’s a great idea — today is Friday (arts and crafts day here, thanks to Tina’s inspiration) and I haven’t a clue what to do. We need to go to Wal-mart today so maybe I’ll pick up some supplies like the plastic canvas. Sandra — I don’t think our Dollar Trees have good stuff like that. Would you grab a couple of packs for me and mail to me? Carla — I’m doing the next lesson in Artistic Pursuits today. It has been a good fit for us, because if I don’t have any other ideas, I can just open the book and go. We’ve done 6 or 7 lessons thus far and there is no teacher preparation for me. AP does list a bunch of supplies they recommend you have on hand. Thus far, though, I have found that we don’t really need all those art supplies. We can learn about landscapes, portraits and still lifes and do all those in color pencil just as well as in watercolor or pastels. Carla, I think I made your remote holder. I knew I made it for someone, but I couldn’t remember who. They’re super easy to make. I know I made a bunch of picture frames. You could easily cut them out for the kids and then have them make patterns. Tina, I might have oversold the Dollar Tree felt. It comes with 14 sheets of 5.5″ x 8.5″, with red, green, black, and white. They also have some foam sheets which are the same size, but more colors. I’d be happy to get you some if you are interested. If you guys want craft stuff, I can be on the lookout. Yard sales often have them in bulk – they just shove everything in a plastic bag and charge a dollar. Buttons, thread, needles, fabric scraps, all kinds of things. I’d be happy to get stuff for you, because I always want an excuse to buy the stuff anyway, and this way I don’t have to feel bad for not making anything out of it! I have all kinds of ideas to use buttons, trim, fabric scraps. Feel free to pick some craft stuff up for me as well, Noogie. I think it’s funny that I’m about to comment on Sandra’s latest blog post on Tina’s blog. Sandra, if you go to YouTube they have a ton of how-to videos to give you inspiration for crafts and such. They really get my let’s-copy-someone-else’s-creativity juices flowing. Tina, we finally watched Bleak House. It was great! I think I’m going to read it now. I downloaded it for free onto Doug’s Kindle. I saw that there were seven comments, so I figured that somebody would have google’d this already, but nobody did so I thought I would. I fully expected Grandma Sandy to jump all over that, but she remained mysteriously quiet.